Auction Alert: 12 gauge Parker DH SxS, 1 1/2 frame…. Here’s a nice Parker SxS that’s coming to auction in a couple days. Morphy’s Auctions in Denver, PA, has it, and their sale starts Saturday, May 23 @ 9:00 AM Eastern. 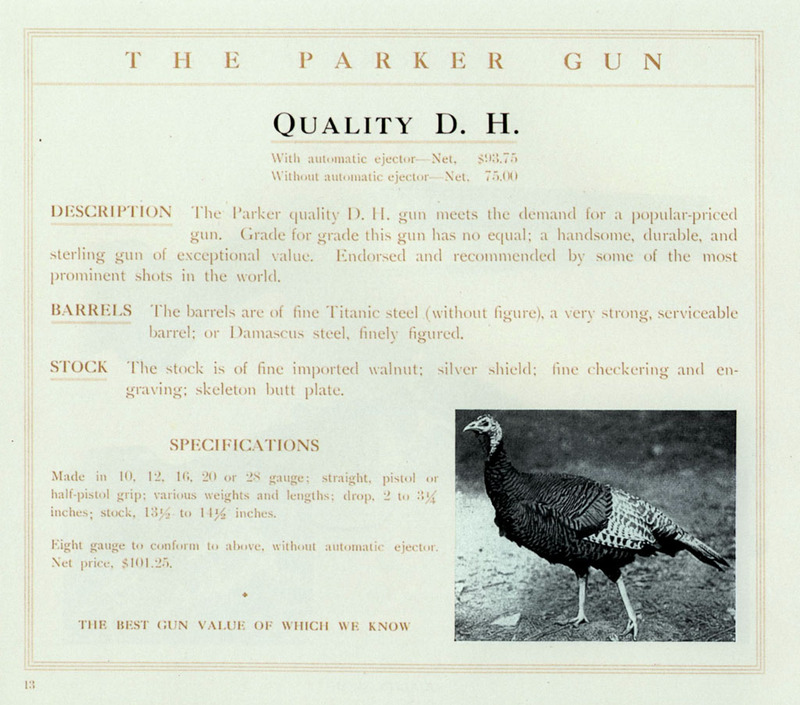 Parker’s Quality DH shotguns were the lowest-grades the company offered as custom-made doubles. In the 1930s, they cost around $148 ($175 with ejectors). At the same time, a Parker A-1 Special went for $825, a Fox XE was $185, and a W. & C. Scott Premier was $1000. Lot #823: Parker D.H. SXS Double Barrel Shotgun #226300: Manufactured in 1928. Parker 12 ga. with 2 – 3/4″ chambers with titanic steel barrels. The barrels show bright shiny near perfect bores with no pitting, corrosion, rust or dents. The left tube shows a bore diameter of .734″ and choked light full with a choke restriction of .034″. Right tube has a bore diameter of .736″ and choked modified with a restriction of .026″. Original barrel blue rates 95%-97%. The fully engraved receiver shows 60%-70% original case colors and look great with the Parker style engraving pattern. Gun is built on a 1 – 1/2″ size frame. The Parker serialization and identification book show this gun left the factory in this exact configuration. The only alteration is a leather recoil pad has been added. 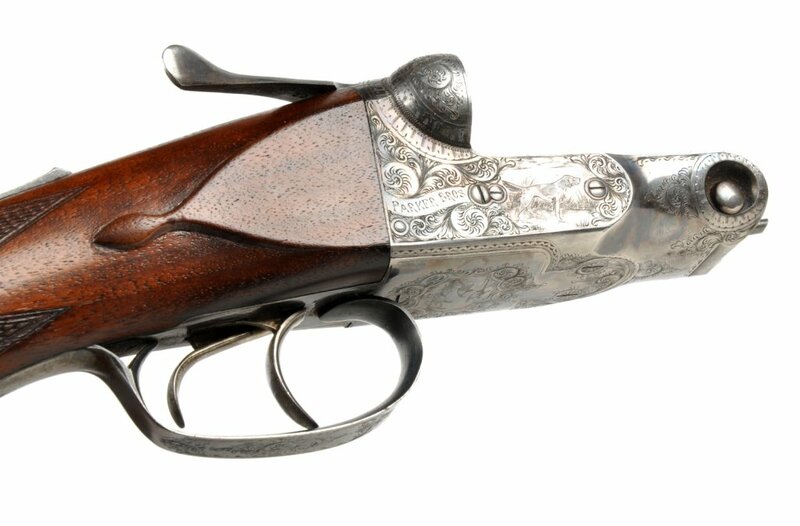 Gun has a length of pull of 14 – 1/4″ and a drop of 2 – 1/4″. The buttstock shows a perfect wood to metal fit, good sharp checkering on the pistol grip. This high condition Parker has a lot of life left in it. It comes with a modern Parker reproduction hard case. This old Parker is very collectible and perfect for the October woods. Wood is excellent, no cracks or chips, sharp checkering, proud to metal. Mint bore, action and lock – up. $185 for a Fox XE? That is remarkable -even in 1930 dollars. Certainly the most bang for the buck of those listed. Yeah – that’s the price A.F. Stoeger was quoting at the time. It’s amazing how prices have flipped on a lot of stuff. Back then, a 12g W & C Scott Monte Carlo B sidelock cost $600 and a 12g Parker AHE costs $487.50. These days, the Parker is worth far more than the Scott – easily 4x – 5x more.